Pick up your hi!Tourist SIM Card when you arrive in Singapore! Subscriber must be at least 15 years old and each passport number can only register a maximum of 3 prepaid SIM Cards in Singapore. We'll send you and email confirmation of your order when you are done. All fields are mandatory. Collection is only available up to 3 months from purchase date. You must be present during SIM Card collection. Please read and agree with the Terms and Conditions before submitting the form. I have read and agreed to the Terms and Conditions of this reservation. The name declared above is the person collecting the Tourist SIM, and he/she is at least 15 years old as of the collection date. Each customer may register only up to 3 Prepaid SIM cards across all service providers in Singapore. Please ensure that you have not exceeded the limit prior to purchase. Strictly no refund or exchange once payment is successful. The minimum age for purchase of Prepaid SIM card is 15 years old. As mandated by the authorities in Singapore, all SIM cards must be registered at point of collection. Customer must present customer's passport together with a printed copy of the order redemption form at point of collection. For verification purposes, the customer's name indicated in the online order form must be identical to the name as set out in the passport presented at the point of collection. 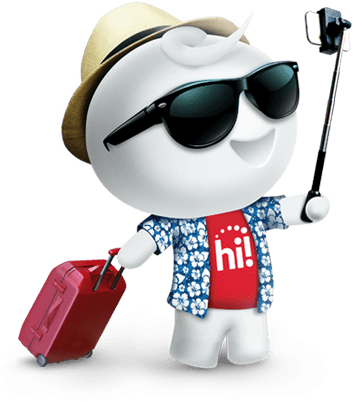 hi!Tourist SIM Card works with any unlocked 3G/4G mobile device. If your mobile device is SIM locked, please contact your current service provider to unlock your device.